GCE provided professional engineering services for The City of Houston for the rehabilitation of storm water pump stations and associated storm sewers at Old Galveston Road, 3500 Kelly Road, and Kelly Underpass. In addition, drainage improvement designs were also performed at the intersection of Alan Parkway and Montrose, and Forest Hill underpass at the Union Pacific Railroad Company (UPPR). Drainage Improvements at Old Galveston Road and 3500 Kelly Road consisted of developing hydrology, replacing two existing pumps with new pumps and piping to accommodate 25-year storm risks, modifying structures, replacing the existing fences and piping, and designing an advance warning system which would trigger when road ponding exceeds 1-foot. 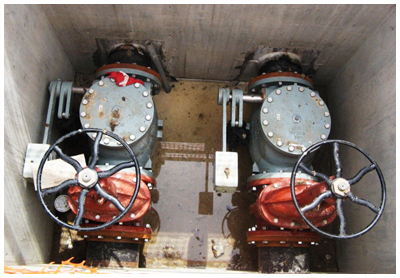 GCE also applied structural modifications to existing pump stations and replaced the existing exhaust fan system. Drainage Improvements at Kelly Underpass included developing hydrology, replacing existing pumps with new pumps, preparing for a 25 year storm condition, regrading a discharge ditch for an approximate length of 100 feet from the pump station to the railroad, preparing railroad permit applications for the proposed construction, preparing TxDOT access permit application, replacing the access hatch, modifying the existing roof to receive the new pump system, installing a new fence for the facility, coordinating with TxDOT and the railroad authority, designing an advance warning system, replacing existing exhaust fan system, and providing a 2-inch potable water service line with meter and hose bibs. Drainage Improvements at Alan Parkway at Montrose included removing and replacing existing storm inlets and pipes, restoring approximately 1,000 square feet of pavement, and preparing traffic control plans. Drainage Improvements at Forest Hill Underpass at the railroad included developing hydrology, replacing undersized storm sewers and inlets, preparing traffic control plans, and designing an advance warning system.